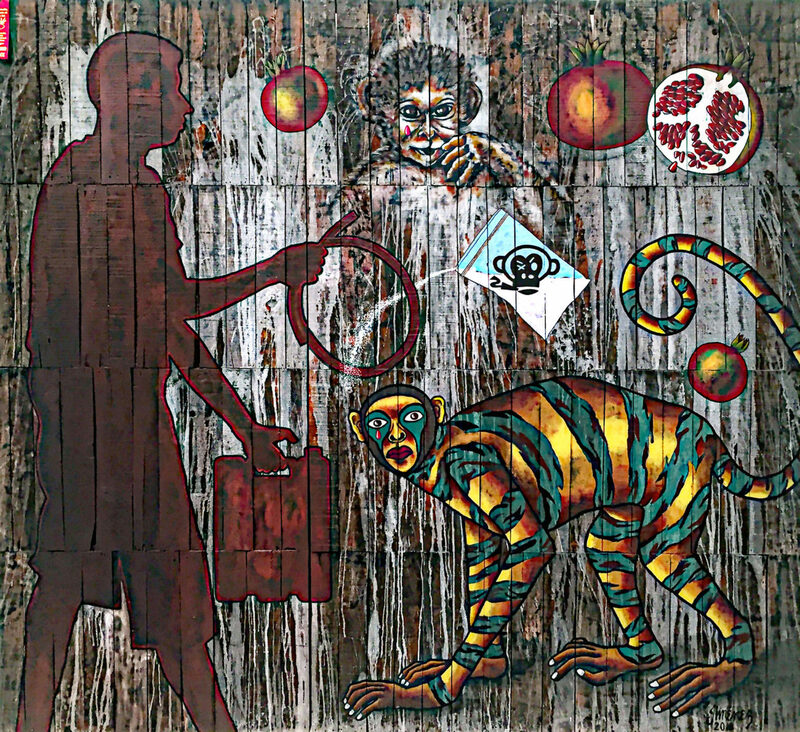 Three oversized works introduce visitors to the artistic force of this ambitious and successful “47th International Art Show” at the Brownsville Museum of Fine Art. This juried exhibition of contemporary art boasts 160 impressive works from Canada, China, Greece, France, Mexico, Singapore and the United states. The main gallery and foyer are dedicated to forms of painting and mixed media; and the smaller adjacent gallery is devoted to sculpture, photography, drawing, printmaking and digital media. Alejandro Macias, UTRGV School of Art lecturer, curated and coordinated this year’s show; Visual artist and filmmaker Mauricio Saenz of Matamoros and Joe Harjo, professor of photography from the Southwest School of Art in San Antonio, served as judges. The majority of art works are from the U.S., and many paintings reflect human and social concerns. Figurative works dominate, but none stop with the figure unto itself; meaningful scenarios and/or situations shape these works. Because 31 works were recognized, only four award winners will be noted here. Best of Show went to the installation, “The Fragmentation of Self” by Jesus Treviño, expressing the psychological and sometimes physical fragmentation that besets us all. 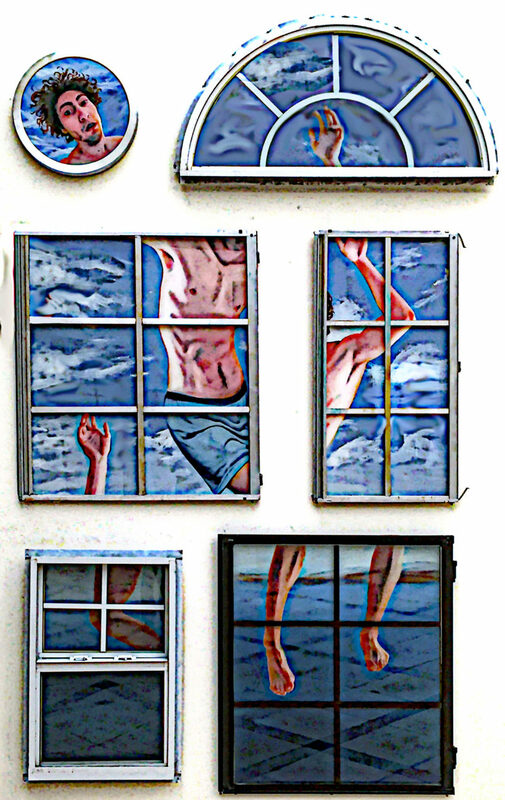 The life-size painted figure is erratically separated from itself behind a group of windows; the symbolic separation of windows signifies a further fragmentation of body and spirit. Veronica Jaeger’s “A Sunday Afternoon in the Clouds” placed first in painting and continues her exploration of a dystopian and futuristic fake world. 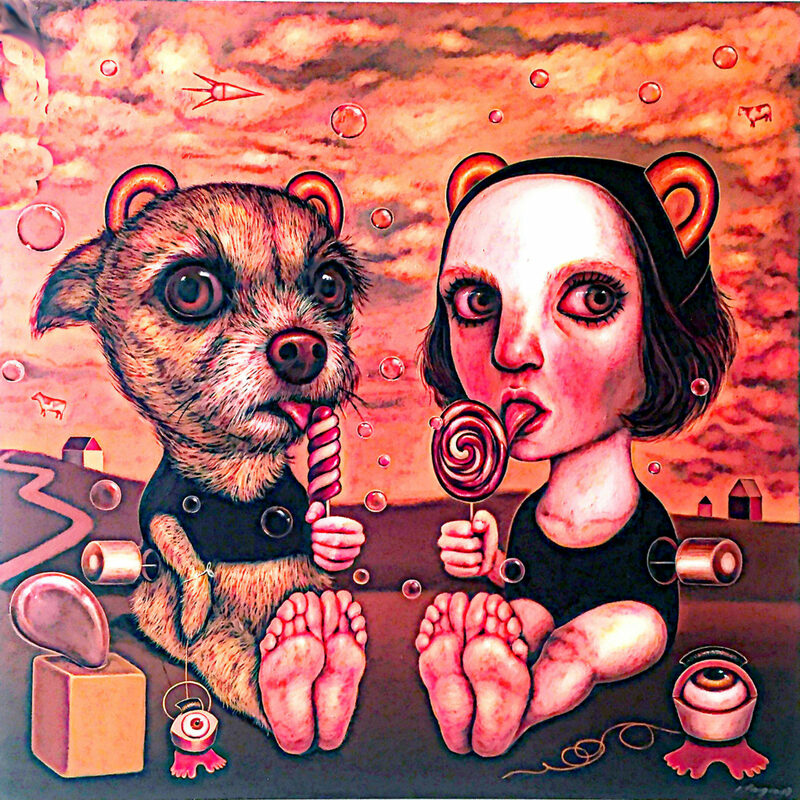 In her painting, a girl and her dog sense anxiety and unrest while relaxing together in a field. First place in sculpture, “Squirrel Mummy” by Trish Igo is conceptually the edgiest work in the show, bringing together art and funerary practices. 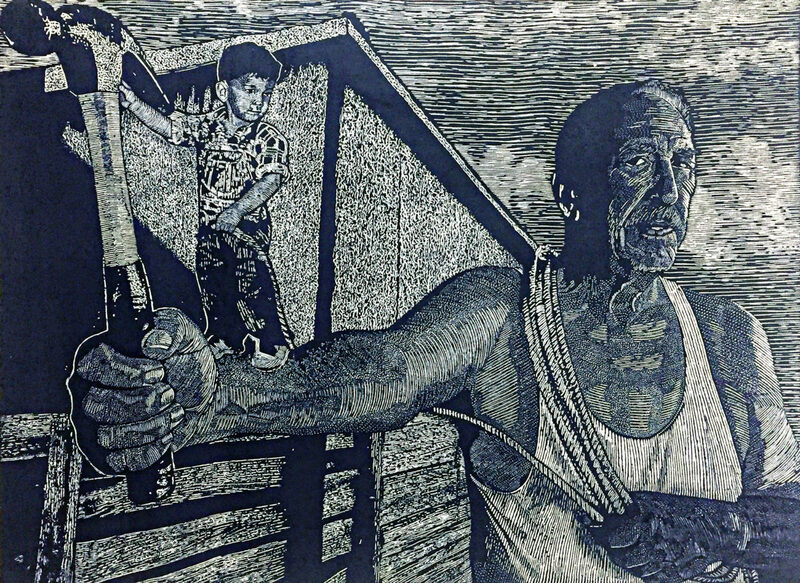 First place in the printmaking category, “Strength of My Father”, a woodcut by Omar Gonzalez, reinforces family values. Other works are richly filled with insightful recognitions and revelations. Political commentaries range from unique matter-of-fact viewpoints to the dreadfully serious. Gary Aargaard, an engaging painter from Arizona, bestows bits of humor in all three of his works. In “Spin Cycle” he juxtaposes treatment of political news releases with the treatment of dirty laundry. They both go through a seemingly tornado-like action and come out nice and clean. 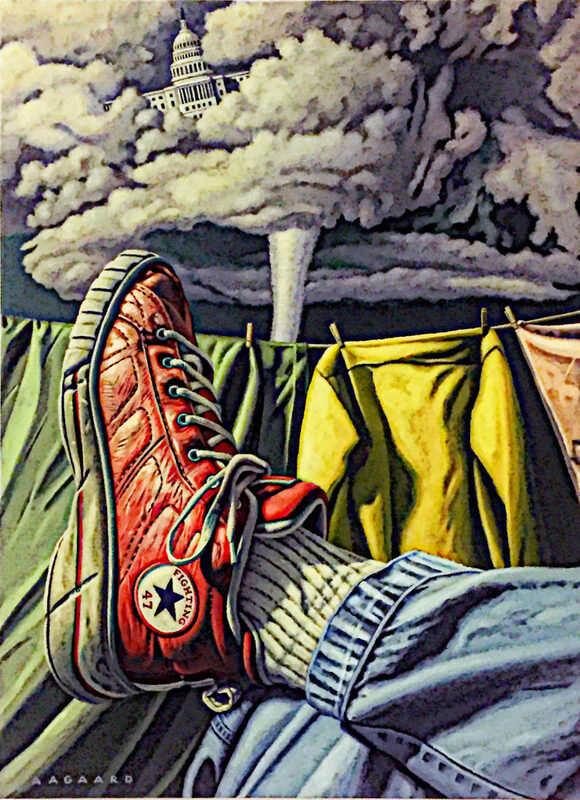 In the foreground of the painting, the average American sits in front of a laundry-filled clothesline with his red athletic shoe placed firmly in focus showing an emblem reading “fighting ’47;” does this represent a veteran or a humorous comment on this exhibit? Or both? And although tornados strike fear, “Sins of My Father Will Never Expire” by Tony Armadillo is scarier. 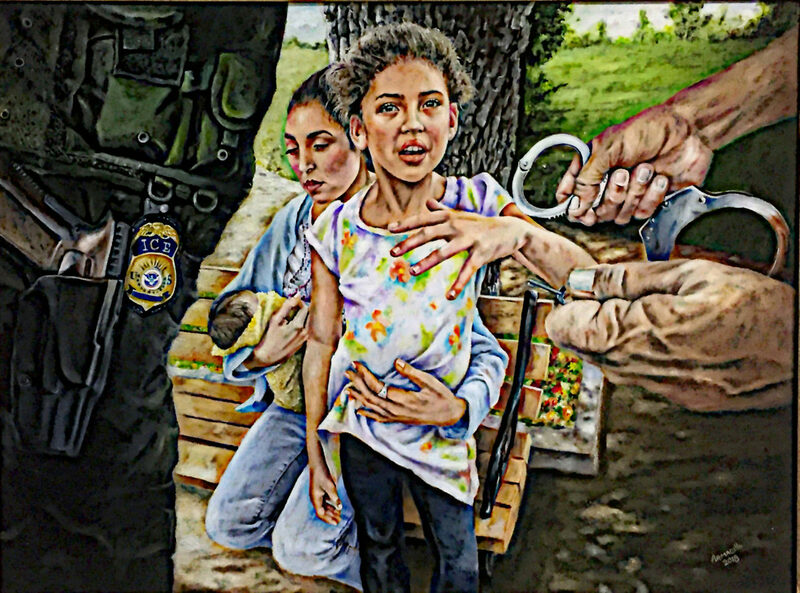 Armadillo comments on DACA families by showing a child with her mother and sibling on a park bench. Our view is the space between two ICE agents approaching them with handcuffs. Pure abstraction is rare here, although some works use realistic elements to create formal compositions. Anne Bascove’s mixed media piece, “Eclipse in Black & White,” is composed of lunar-eclipse drawings and debris. Its crisp shapes move though the collaged work in an organized confusion. The museum’s “47th International Art Show” is a must-see. Plan to spend at least a full hour with the art. The only downside to this show is that it should be on view for an additional month. Nancy Moyer, professor emerita from the University of Texas Rio Grande Valley, is an art critic for The Monitor. She may be reached at nmoyer@rgv.rr.com.